In graduate school in the Museum Education Program at George Washington University (admittedly more years ago than I should admit to), the first semester was dedicated primarily to the idea of object-based learning. How does one teach with objects? How do you select objects for a tour investigating a larger theme? This course of study made sense, because museums are places that collect and display objects. But this is generally not the case in children’s museums. Children’s museums curate experiences, not objects. They are, essentially, indoor programmed play spaces. But if they are not object-centered institutions, why are they museums? Are they museums? This question is clearly important for children’s museums, but also of broader importance for all museums, as a subset of a larger question: What makes a museum a museum? 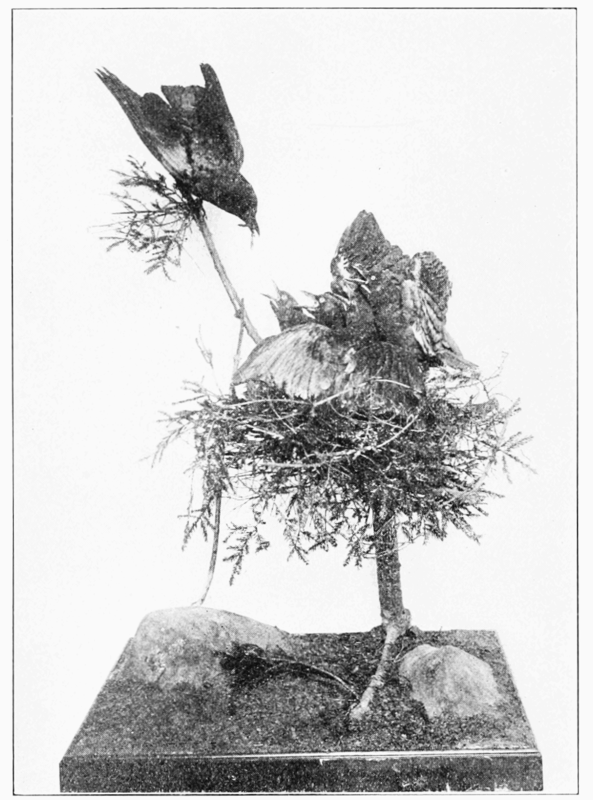 An object on display at the Brooklyn Children’s Museum in 1908, from an article in Popular Science Monthly. When I went to the Brooklyn Children’s Museum as a child, it was like any grownup museum you would go to – there were objects in cases, and registry numbers on labels. The difference was that the collections they presented tended to be things they thought children would be interested in: toys, dolls, anthropological objects, botanical specimens. Michael Spock became the Director of the Boston Children’s Museum in 1962, and asked, why do we have stuff in cases? Children want to touch things. He culled the collection and took things out of their sanctified resting spots. This happened at the same time as a lot of research about informal learning and its value, from psychologists such as Howard Gardner. Children’s museums have spread ideas about learning and engagement exceedingly well. Learning has become the prime directive in any museum, and it is now hard to walk into any museum without seeing children’s activities, workshops, etc. A generation ago this did not exist. Children’s museums have had a profound impact on the grownup museum field. Children’s museums have allied themselves with the museum community. One of the unspoken ideas behind children’s museums is that they introduce families with children to the concept of a museum, with the understanding that these children will grow up and become patrons of other museums. 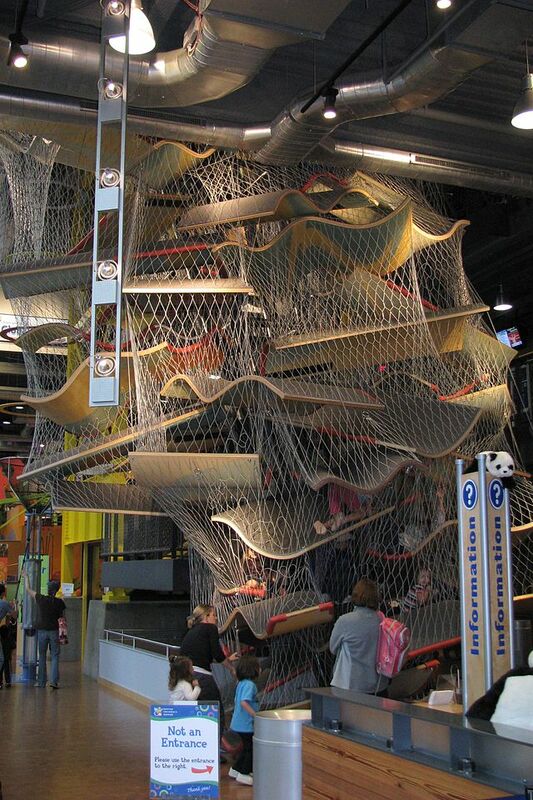 The New Balance Climb at the Boston Children’s Museum, by The Bostonian Longhorn, accessed on Wikimedia Commons. Museums are part of a panoply of sibling organizations which have two competitive advantages. One is that they are sites where strangers can safely interact. Sometimes people refer to that as public space. The other is that they have three-dimensional evidence set up in a mode that induces personal learning. By three-dimensional I don’t mean collections only, and think that creating authentic tactile experiences or contemplative sensory locations count as well. Children’s museums are places that specialize three dimensional experiential learning. Botanic gardens and zoos are places that I consider siblings to museums. Parks may also be part of our family depending on the opportunity that parks have designed into their experiences. I am no longer interested in the classical narrow definition of museums – collect, preserve, educate, research and exhibit. I care more about creating safe public spaces where strangers meet, that are welcoming and set up for free-choice learning. Three-dimensional learning is important because it has different sensory components than two-dimensional learning. One of hallmarks of children’s museums is that they create experiences. These tactile experiences have been carefully designed to provide ways of understanding the topic for a multiplicity of ages. Other museums have copied the techniques originated in children’s museums. Not all experiences are the same, however. At the Boston Children’s Museum we used to talk about “flappers and crankers,” meaning push buttons that were facile but might not facilitate learning. Sometimes museums have been very easy on themselves thinking any interaction is equally educational. Obviously pushing buttons randomly is an experience, but it is not necessarily learning. On the other hand learning, especially conceptual learning, is very complex and is understood and integrated in small bits. Museums don’t have to offer a complete learning experience but they should offer opportunities for individuals to add new “bits” of understanding. Children’s museums can help themselves by testing and retesting their exhibition ideas to see if they add to experiential learning they desire. While it looks simple, the critical testing is what makes interactive exhibition design become a gateway to new understanding. 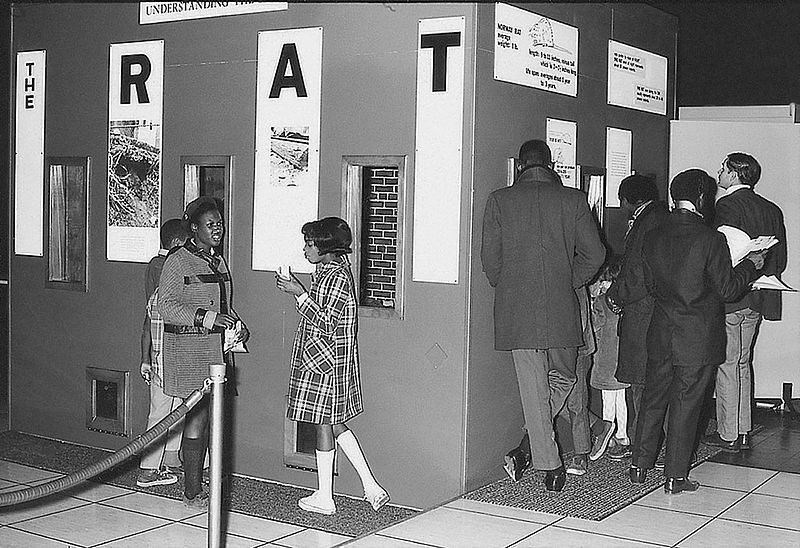 The exhibition “The Rat,” at the Anacostia Neighborhood Museum, which Weil uses as an example of a museum dedicated to serving its public. Stephen Weil argues that museums as non-profits have made a commitment to provide “demonstrably effective programs that make a difference in the quality of individual and communal lives.” Rather than defining themselves by their collections, museums should define themselves by their relationship with their public. To serve this public well, museums must “be of profound service… [they must] use their competencies…to enrich the quality of individual lives and to enhance their community’s well-being”. They might do this by providing a safe space, a personal haven, an opportunity for individual growth. While Weil was not, in this article, explicitly addressing the question, “Why are children’s museums museums?”, the answer inherent in his writing is that children’s museums are museums because (and if) they serve the public in important ways. So When are Children’s Museums Museums? Of the three answers cited in this post, Barbara Meyerson’s is, I would venture, the most accurate: children’s museums are museums because of their historical origins. The decision to keep the word “museum” in the name, and to ally themselves with organizations such as the Association of Children’s Museums and the American Alliance of Museums offers children’s museums a certain cachet: The word “museum” implies, to a certain demographic, that they are simultaneously educational and fun. It suggests that there is cultural capital to be gained by taking your children to these spaces instead of an amusement park or the playground. Children’s museums are museums, then, because and when the word “museum” proves a useful marketing strategy. Under what conditions do children learn? What the difference is between play and learning, and when do these overlap? What does it take to connect physical manipulation of or within a space into cognitive or emotional engagement? How do the answers to these questions vary by age group? What is the role of social interaction in learning within a children’s museum? What does it mean to serve a public? Which public(s) are we serving? What conditions need to be in place to be of service, or to be public-oriented? Museums today are used as tools of city- and community-building – what is the difference between the individual public good and the benefit of a city or neighborhood? If children’s museums fail to consider these questions, to provide real three-dimensional learning experiences or to be of service to their public, do they fail at being museums? Yes, if you agree with these definitions. The vast difference in these three definitions makes evident that each of us may have a different response to this question, or to the umbrella question of “What makes a museum a museum?” Our responses are important because they drive the concerns that we address, the things we need to think about to ensure that museums are the institutions we want them to be. What other ideas are out there? Why is a children’s museum a museum? What makes a museum a museum? Please share your own thoughts, and any interesting relevant theories you have come across. Thanks, Gretchen, for pointing me to this issue of Exhibitionist. Eugene Dillenburg writes, “Exhibits, I will argue, are the defining feature of the museum. They are what make us different from every other type of public service organization…. Only the museum uses exhibits as its primary means of fulfilling its public service mission. Thus, a more robust definition of a museum might be: an institution whose core function includes the presentation of public exhibits for the public good. A museum can do many things, but to merit that title it must do exhibits.” I think this is similar to what Elaine says, without the argument for encountering strangers. Jenny-Sayre Ramberg with Sonal Bhatt and Kitty Connolly examine why zoos, botanic gardens, and aquaria are museums. They conclude, “Professionally, being identified as museums makes us part of a larger group of institutions in service to society and its development….Having professional acknowledgment from our museum peers as important social and cultural institutions supports our authority in our missions to inspire protection of humanity’s natural heritage, nature and wildlife.” This resonates with Barbara’s historical explanation of why children’s museums are museums. Thank you, Rebecca, posting for this lively question. It’s one I hear discussed often, but usually not in much depth and from various interesting perspectives. Identifying exhibits as the feature distinguishing museums from other types of public service organizations is a very valuable and important addition to defining “museum.” It underscores the significance of three dimensional and contextualized learning that occurs in museums and distinguishes them from schools. Objects, collections, and supporting experiences are integral to three dimensional learning. The question about children’s play vs. learning in museums overlooks that learning is broad and wide, episodic, and takes many forms for both children and adults. Play-learning is less of a dichotomy or trade-off than we usually assume. It is, in fact, very much in the nature of the learning we see adults engaging in in museums. Are adults who are looking at art–reading labels, talking, and sharing stories–learning? or are they socializing? In so many ways the line between children’s museums and “museums” has blurred over the years: interactive experiences in many-many museums; education and public service at the front of the ICOM definition of museum; museums being for an audience rather than about something; and a broader understanding of learning. Thanks Rebecca, Barb, Elaine, Gretchen! Jeanne – your comment, and thinking about the vocabulary we use to describe museum experiences (learn, play, socialize, experience) sends me into a bit of a tailspin… All these words are so big and vague that they become useless. How do we develop a vocabulary that is specific enough to help us understand and define what we do? Do we keep adding and blurring words because we want to be everything to everyone, or is it an unavoidable linguistic phenomenon? Rebecca, I agree that it’s very important to take on the vocabulary we use in museums and sharpen what terms and constructs mean rather than slinging them about. Increasingly museums are doing that as part of developing learning frameworks around the complex ideas that are most relevant to the learning value in their particular museums. At the same time, some of these constructs simply do lean into each other. Play is not the opposite of learning and yet all play is not learning. Connecting the dots between the two (and looking at the role of social interactions, exploring objects and materials, etc.) or unpacking creativity, inquiry, etc is the work many museums are engaged in. Hi Rebecca, I’m really enjoying you blog. This is a great analysis of a much discussed question. Children’s museums obviously vary greatly in the kinds of experiences they provide and the backgrounds of the professionals who staff them. Slightly off topic, but nonetheless, recently I’ve been thinking about how traditional museums derive their content focus from their collections. Having a focal point for content helps museums differentiate themselves, build their brand, and concentrate on their institutional values and vision. As Nina Simon pointed out several years ago, children’s museums are one of the most vulnerable to homogeneity (http://museumtwo.blogspot.com/2010/03/in-support-of-idiosyncrasy.html). A few museum questions of my own are: What would a children’s museum look like that has a collection, not of physical objects, but of ideas? What if it treated those ideas with just as much care and depth that traditional museums treat their objects. What would the job description be for the Curator of that children’s museum? Thanks for this comment, Alli – I think your point about homogeneity is an important one. A few children’s museums do have collections – the Brooklyn Children’s Museum and the Indianapolis Children’s Museum, for example. I wonder if this makes them less vulnerable to homogeneity? I also wonder if non-children’s museums don’t suffer from that as well in this day and age. From deep inside the galleries of the Art Institute of Chicago or the Metropolitan Museum of Art, can you tell which one you’re in without looking for a logo? How important is it for each museum to be unique? If one museum has a great idea, is it bad for others to copy it? And if it’s important to be unique, how do museums find their own unique character? Answering your questions with more questions, sorry. Partly in response to Alli’s point and your response, and partly in response to the idea of exhibits defining museums, I was reminded of some of the most powerful children’s exhibits that I could remember (albeit from having visited as an adult, not as a child). What sticks out at me are the exhibits that are specific to the content of their communities. Yes, each children’s museum might have a grocery store section, but isn’t it cool to see on the shelves products that reflect the ethnographic make up of the community? At the Mid-Hudson (NY) Children’s Museum (my local CM), there’s an exhibit about a drop of water from the Hudson River. It demonstrates basic scientific principals (such as at many a CM), but it does it in such a way that children are also learning about the immediate geographic location. At another CM–in Virginia, I think–there was a woodland exhibit that was specific to the flora/fauna of that particular part of the state. In these cases, there was a reliance on some general exhibit types that work, but the content was unique to the museum/community. This provided for different types of learning experiences, both the content of the exhibit as well as the awareness of the community, and this in turn allowed for more conversations for our family in the museum and afterwards.